Controlled Air Inc, recognized by Johnson Controls, Inc. as Contractor of the Year | Controlled Air Inc.
For Immediate Release: Controlled Air, Inc. of Branford, CT, was recently recognized by Johnson Controls, Inc. (NYSE: JCI) as a top performing Authorized Building Controls Specialist (ABCS) contractor at a national sales conference in Orlando, Florida. Controlled Air, Inc. was honored for exceptional sales over the previous year measured as a combination of sales volume and percentage of sales growth. 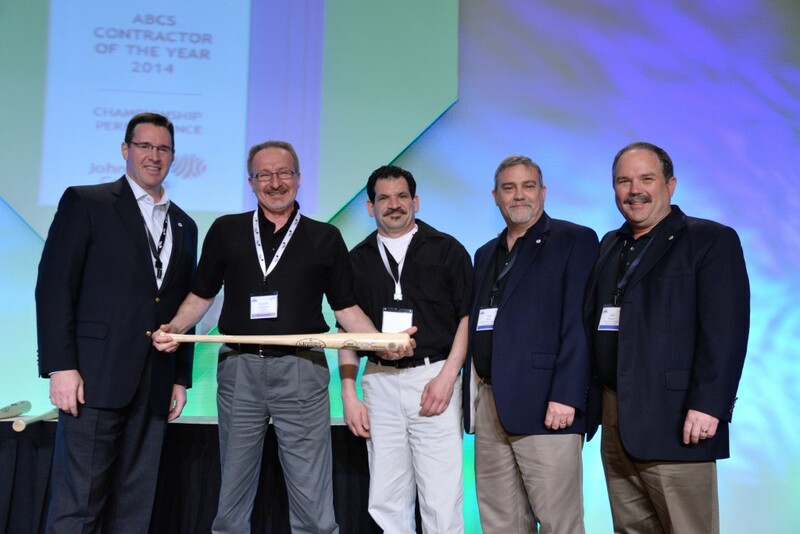 Christian A Eichmann, Vice President & General Manager of Controls & BAS Distribution, N. America for Johnson Controls presented the 2014 ABCS Contractor of the Year Award to Controlled Air, Inc.
Vincent Chiocchio, President of Controlled Air, Inc. was honored to have received this award. Vincent states, “Our twenty year partnership with Johnson Controls helped us become the local leader in providing energy efficient HVAC solutions.” Vincent and Controlled Air, Inc. believes improving energy efficiency is the first and most important step toward achieving sustainability in buildings and organizations. Energy efficiency helps control rising energy costs, reduces environmental footprints, and increases the value and competitiveness of buildings. Building Controls from JCI are a big step into attaining energy efficiency and control over a buildings environment. Controlled Air, Inc. is an Authorized Building Controls Specialist (ABCS) for Johnson Controls Facility Explorer product line for Connecticut. Controls combine the ability to see, identify, and act upon critical systems information and possible problems almost as quickly as they occur, as well as the ability to monitor and operate all of your systems from one place. Johnson Controls, Inc., is a global market leader in automotive systems and facility management and control. In the automotive market, it is a major supplier of seating and interior systems and batteries. For nonresidential facilities, Johnson Controls provides building control systems and services, energy management and integrated facility management. Johnson Controls, founded in 1885, has headquarters in Milwaukee, Wis. Visit http://www.johnsoncontrols.com for more information about Johnson Controls.